One of the very few Meccano parts that has been almost entirely unchanged since its introduction, it is very difficult if not impossible to distinguish between a pre-1920's and post-1960's spring. The original outfit 7 contained as many as 15 of these springs, substantially reduced in later years with only four in the 10-outfit. There are a number of different finishes from the French factory, including nickel and chrome tension springs and a reported instance of a shorter 1½'' version. However, it is not thought that any of these were supplied from Binns Road. One other variation has been noticed, a tension spring with wire around 10-15% thicker than normal, and hence fewer turns per inch than a standard spring. It is not known where this version comes from – does anyone know? Is this a very early version? Standard springs are around 37 turns per inch, the one in the picture to the left has 33 turns per inch. Many smaller parts were supplied in small paper envelopes, both before and immediately after the war. 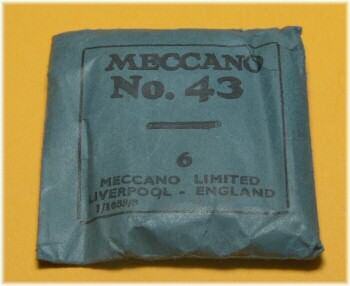 Helpfully for us, Meccano has printed the date code on this particular pack of six tension springs, you can see the code 1/1038/3 signifying October 1938, and a print run of 3000. Later parts were supplied in yellow boxes as this example. The yellow label and product code show that this box dates from after 1954, but could be any time up to the early 60's as the parts are not coloured. 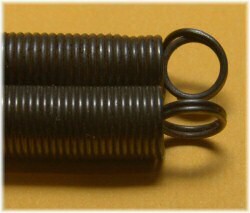 The tension spring with the thicker wire is almost certainly Marklin and not Meccano. The spring from a 1956 Marklin set is pretty much identical with the one illustrated.